In the last few weeks, I have been busy creating a complex report for a client. The output itself is in Excel so he can continue the analysis by slicing and dicing the data even further then what I am providing. To be able to provide data in an appropriate format, I needed to rely heavily of SQL Pivots. You can find a definition of pivot tables on WikiPedia. This month article is about some tricks I needed to figure out to render the data. All the SQL code for testing is included in here. I haven’t created a downloadable file for it. Feel free to just copy and paste the code from here. To be able to execute the queries from this article, you will need to have access to a Microsoft SQL Server 2008 (or better). If you don’t have access to one and would like to test the feature, you could also give a try to SQL Fiddle. If all the request to create pivot tables were that easy, it would just be to simple but it isn’t the case and you quickly get into results that you are not expecting. Notice here that the pivot query hasn’t changed at all. The generated output would contain many rows that you were probably not expecting. The reason is that any columns that are available are passed to the PIVOT function, so all apart from the column aggregated, and the column pivoted are implicitly grouped by. By running this new query, you would get exactly the same results as shown in figure 1. I don’t know if you notice in the previous results (figure 1 and 2) but a column is shown for products P2 and P5 even if I don’t have any data for those products. There is apparently not much validation on column names. You could also easily omit one product name and the query wouldn’t complain. This is the other issue that you might have. The columns to output (the product in my case), should really be dynamic. But they aren’t. At least not directly. Notice that I had to transform my table variable (@table) to a temporary table (#table) to be able to use it from my dynamic SQL. If you rely on real tables, you won’t have that issue. 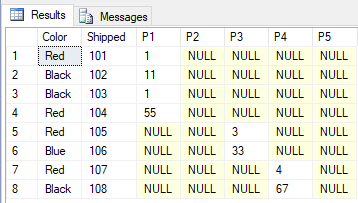 With this query in place, running the query will give you only the columns for existing products as shown in figure 3. You might come up with a situation (it happened to me, it can happen to you!) in which you need to pivot a single column of data. The problem is that you normally have nothing to pivot against if you only have 1 column. The trick here is to introduce a second dummy column, a simple Row_Number, just to get a second column. Need to pivot on dates? Notice that the sub-query is using the Year and Month function to create 2 new fields from your date. Pivoting a table is an extremely useful feature of SQL. It is missing some features but known and documented workarounds make it very powerful. If that feature is interesting for you, you might also want to read about the unpivot feature which does the reverse and is much simpler to use as there is no aggregation of data whatsoever.